CleanMem is an application that releases part of the RAM memory of your computer every 30 minutes without having to do anything. The RAM memory is in charge of storing the processes that are running on the system. It's possible that you may have noticed that your computer works rather slowly and you don't know why. This may be due to the fact that the applications being launched consume a lot of RAM memory and the system is being left with hardly any memory available. With this tool you will manage to free your computer's RAM memory every 30 minutes. CleanMem sends a request to each different process asking to free memory, in other words, it will ask if they can release the RAM that they are currently using. CleanMem doesn't run all the time, it will actually activate every 30 minutes by means of the Windows Task Manager. If you want to change the interval of time, all you will have to do is access the Task Manager and edit the amount of time after which CleanMem will launch. Thus, it is important that you have the Windows Task Manager active, or this program won't work. Furthermore, the application has a monitor by means of which you'll be able to see the memory that is being used and the amount of processes that are currently running. 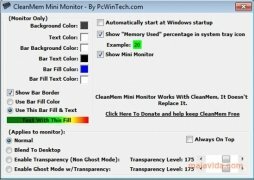 CleanMem will manage to make your computer work much quicker without you even realizing.